Posted May 2448, 2018 by McIvor Farrell & filed under News. 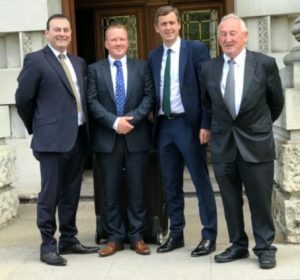 Victim’s Campaigner Raymond McCord is mounting legal challenges in Belfast and Dublin on the basis that current criteria for calling a referendum on a ‘border poll’ is vague and UK Secretary of State has “unfettered discretion”. Mr McCord is mounting the challenge on the basis it could lead to political instability. Speaking about the case Ciaran O’Hare and Paul Farrell of McIvor Farrell, insisted certainty was needed on the issue. They were joined at the hearing by Irish Senator Mark Daly. In the past week UK politicians appear to have a variety of opinions on the issue with the Secretary of State for Northern Ireland stating that conditions for a poll are not met but UK Prime Minister says they may. While the Leader of the Opposition claims conditions do exist for a border poll. Paul Farrell highlighted that none “have defined what the conditions are”.